At the end of training camp, Dana Tyrell was given the unfortunate news. Despite more than 100 National Hockey League games to his credit, there was no room for Tyrell on the Tampa Bay Lightning roster. The speedy winger cleared waivers and was sent to the AHL’s Syracuse Crunch for the third time in two years. "It definitely doesn't feel good to be put on waivers, but that's a part of the business and a part of the game," Tyrell said. "I've been through it before, so I knew what to expect this year. It's nothing I'd want to go through again." TAMPA BAY – The Tampa Bay Lightning have recalled forwards Dana Tyrell and Brett Connolly from the Syracuse Crunch of the American Hockey League, vice president and general manager Steve Yzerman announced today. Additionally the team has reassigned forwards Mike Angelidis and Ondrej Palat, along with defenseman Andrej Sustr and goaltender Cedrick Desjardins to the Crunch. 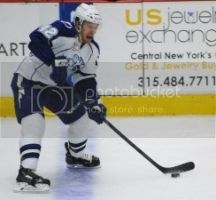 TAMPA BAY – The Tampa Bay Lightning have recalled forward Mike Angelidis from the Syracuse Crunch of the American Hockey League, vice president and general manager Steve Yzerman announced today. Additionally, the Lightning have reassigned forward Dana Tyrell to the Crunch. Angelidis, 27, has skated in 64 games with the Crunch this season, recording 10 goals and 21 points to go along with 142 penalty minutes. He ranks second on the team behind Radko Gudas in penalty minutes. The current Crunch captain also ranks tied for first on the Crunch with two shorthanded goals. Last season, Angelidis scored his first career NHL goal in his NHL debut on January 24 against the Columbus Blue Jackets at the Tampa Bay Times Forum. The 6-foot-1, 212-pound forward skated in six games with the Lightning last season and collected a goal and five penalty minutes. After falling behind 2-0 in the second period after a miscue by locked-out Minnesota Wild defenseman Clayton Stoner, Banska Bystrica battled back to get within a goal in the third but ultimately came up short against the league's best team, which scored an empty-netter with three seconds remaining, on Sunday. Tyrell played, and was again held scoreless, in his second-consecutive game since returning from injury. Banska Bystrica (14-16-4-2, 52 PTS) now return home for a match against Poprad (13-16-3-3, 48 PTS) on Friday.